Gorgeous red, white, and silver sequined solo dress. 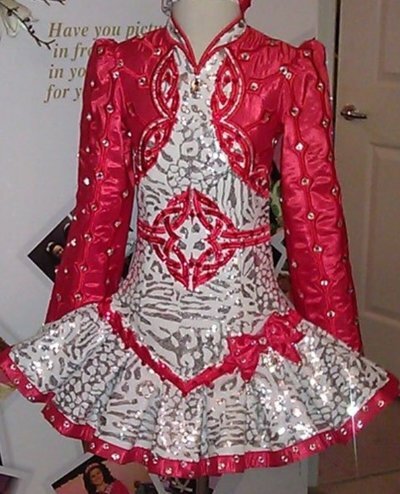 Worn to Worlds, this dress shows beautifully at both feisanna and major competition stages. White and silver material is all sequined. Like new condition. Fully lined. Red bolero styled jacket has clear crystals throughout. Bodice belt is embroidered with red crystals. No crystals missing. Comes with 2 polka dot bloomers. Number clip sewn below bow on skirt. Approx 1-2 in let down. Asking Price: $US1000.00 OBO. Shipping costs are not included in the asking price. Returns are negotiable.